If there is one thing this mama likes is easy to use products that get me looking my best with little effort and time. With a toddler running wild around the house the time I have to blow dry, straighten or curl my hair is very thin! 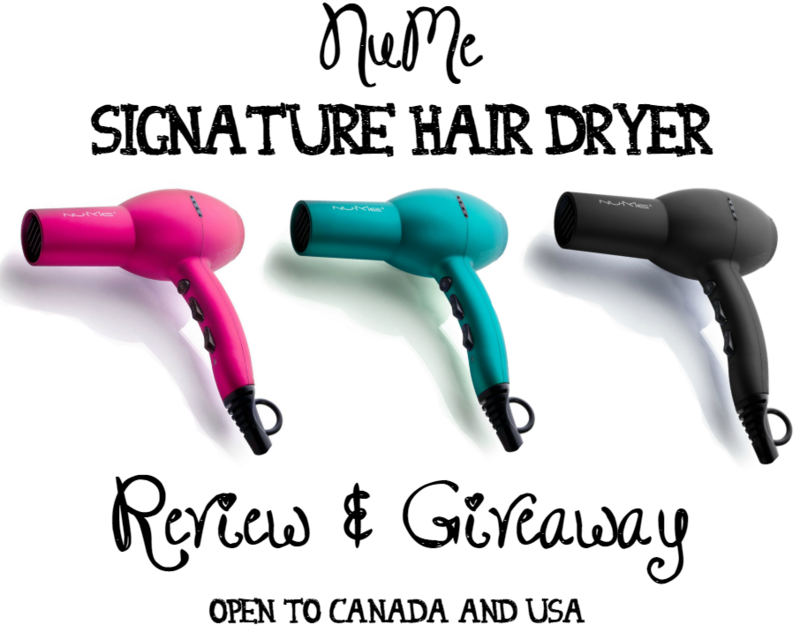 I’ve been having a secret love affair with NuMe Professional Styling Products for a few years now and today I will share my thoughts on the NuMe Signature Hair Dryer. I have almost fully replaced all of my old styling tools for NuMe Professional Styling Products and I could not be happier. I currently own two NuMe flat irons and the Signature Hair Dryer. I have my eye on a few of their curling wands and will be adding a couple to my collection soon. I love the packaging the product arrived in. It is sleek and a great sturdy box that I can use to store my dryer or re-purpose as a DIY project! I will most likely will cover it with a beautiful paper and use it to hold photos or other keepsakes since the box is like a rock! The Signature Dryer is the official dryer of stylists and industry professionals. If you’re seeking a perfectly smooth and glossy blowout while infusing moisture back into your hair, look no further. Cutting-edge negative ion technology and the latest advancements in ergonomic design are behind the power of the Signature Dryer, providing your hair with strength, major volume, and a seriously luminous shine. I spent years working administration jobs for the Government as well as now working on a computer probably more than I did when I had my comfy Government job. With all this computer work I have carpal tunnel which causes my great pain in my wrists when it flares up. For this reason I find many dryers on the market hard to use as they tend to be heavy and bulky. 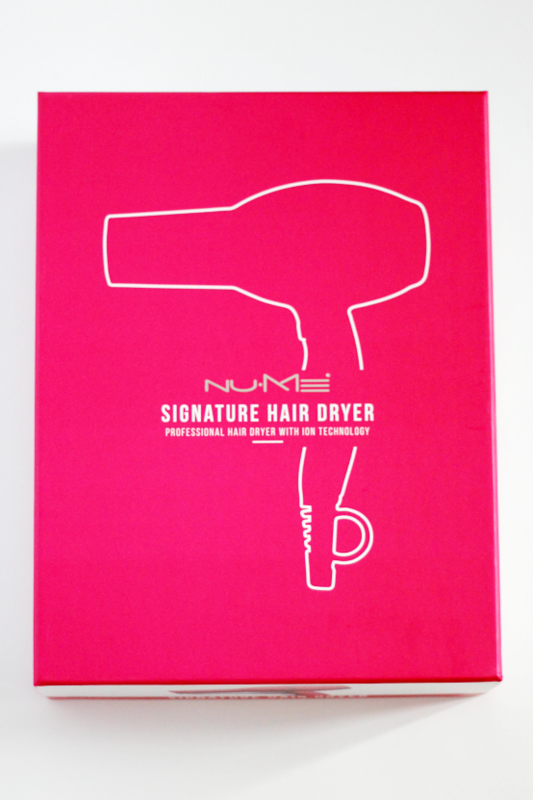 For me the biggest thumbs up for the NuMe Signature Hair Dryer is that it is extremely lightweight. I was very impressed when I picked it up for the first time, I knew I had found my forever dryer! Even though it is lightweight it is a powerful dryer unlike travel dryers, which are lightweight but often less powerful leading to longer drying time. The sleek design of this dryer makes it extremely easy for me to hold and dry my hair. I’ve probably owned a good 10 hair dyers over my lifetime and this by far is the least bulky dryer I have ever owned. I also love that it comes in a variety of colour choices. I have owned the black NuMe Signature Hair Dryer and it met a sad demise when I left it on the counter one day in a rush and my lovely toddler thought she would be a big helper and put it away …. in the TOILET! I replaced it with the hot pink, which if you have been a follower of my blog for a few years you would know is one of my fave colours! I even dyed part of my hair hot pink for years that is how much I love the colour pink. 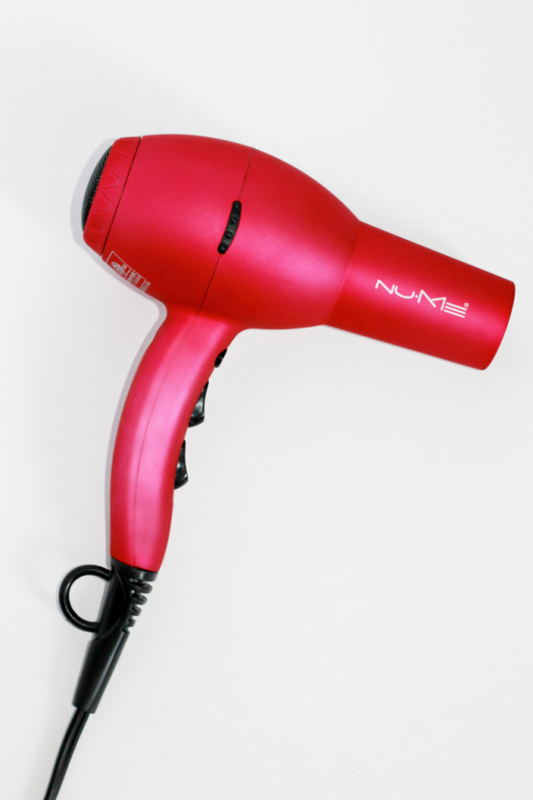 The NuMe Signature Hair Dryer has the perfect amount of settings. It has three heat settings, 1 is cool air, 2 is warm air, and 3 is hotter air. 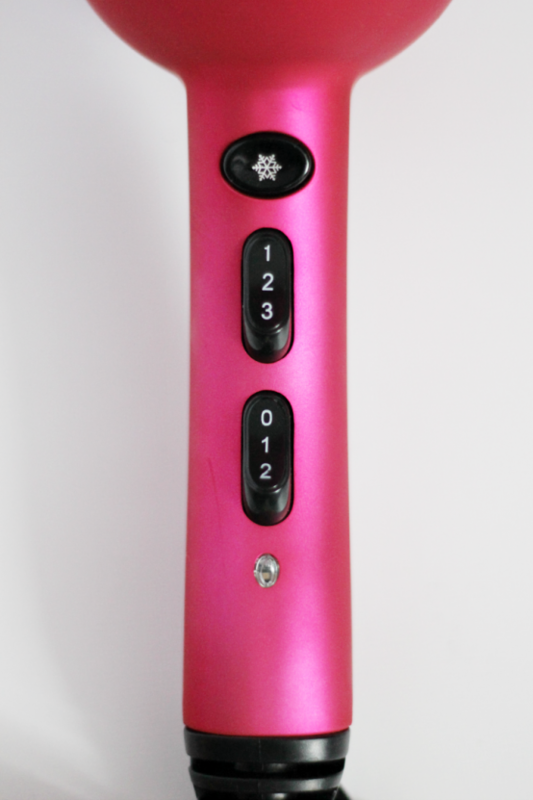 It also has two air flow settings, a lower one that I like to use on Bella, the cat after he has a bath, or my bangs. The higher air flow setting is perfect for the rest of my hair drying needs. Last but certainly not least the cold air setting, the lovely little snowflake, is perfect for finishing off your style as a blast of cold air helps give your hair a bit of a shine! 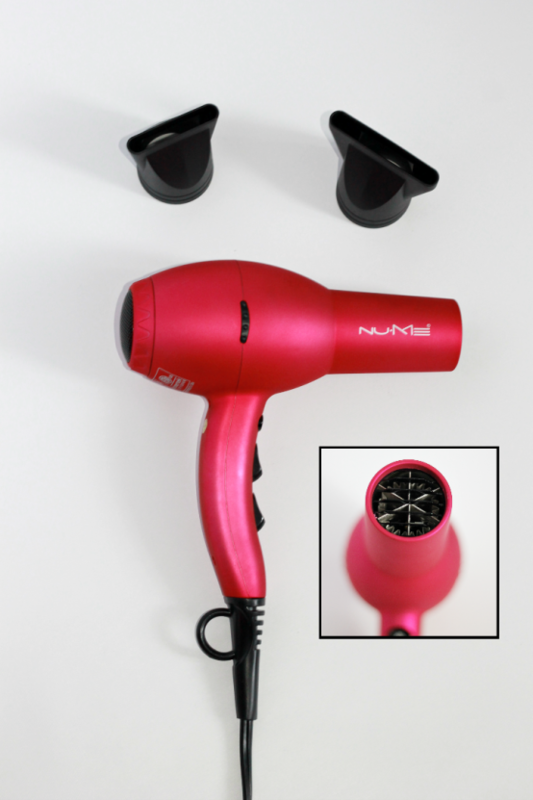 The nozzle is a perfect size and when you use one of the two attachments, concentrators, that come with the NuMe Signature Hair Dryer you can get precision drying for a perfect style every time! The only thing I wish they dryer had come with is a diffuser, I love using it when I want beachy waves but don’t have the time to curl or sleep with braids in my hair. They do however sell them separately on their site. NuMe Professional Styling Products currently has some great sales on some of their hottest products! *The FREE Shipping is only valid on US orders, prices are in US dollars. Giveaway is open to both Canada & USA. To enter the giveaway please complete the mandatory entries on the widget below. You MUST complete ALL mandatory entries to be eligible. Once you have completed the mandatory entries the widget will open up more entry options to gain extra ballots into the draw. Remember to come back to this blog post each day as there are some entries that you can complete daily to earn even more ballots as well as a tweet one that you can do twice per day! The giveaway runs from Friday April 8, 2016 to 11:59 PM EST on Friday April 22, 2016. Once the giveaway closes we will verify all entries for completion. A winner will be drawn from all eligible entries and will be contacted on Monday, April 25, 2016. The winner will have 48 hours from the time of contact to respond to claim their prize. If the winner fails to claim their prize a new winner will be drawn and given 48 hours to claim. 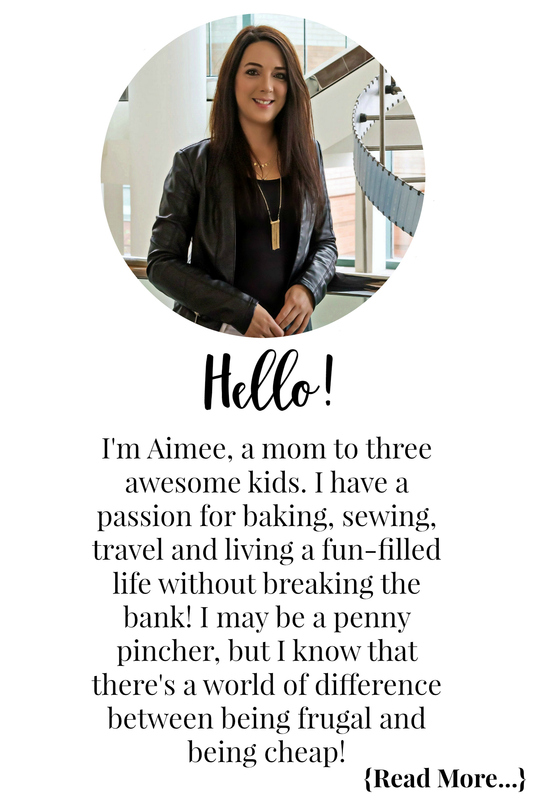 Disclosure: Although this post has been sponsored by NuMe Professional Styling Products, the opinions and language are all my own, and in no way do they reflect NuMe Professional Styling Products. Any product claim, statistic, quote or other representation about a product or service should be verified with the manufacturer, company, provider or party in question. I love the sleekness of the purple NuMe if I were to win! So pretty…would love to try one! I would choose the black NuMe Signature Hair Dryer!! PINK….!!! 3 girls living in our household! Pink has got to be it!!! Thank you! Pink of course! With 2 little girls who love pink, they would actually like to have their hair dried with this! Would love the hot pink one for sure! Would love the Turquoise one if I win! I would definitely pick the pink if I won, looks like a great dryer! Oh nice! I would love the PINK one… My favorite colour always! I would definitely choose the pink! I love the turquoise. Thanks so much for the great giveaway! With two girls I can use a Nu-ME. I would choose the black. Thanks for the awesome giveaway! I love the turquoise dryer! I would definitely choose the pink one! I love the turquoise one!! I am dur for a new dryer!! I like it in the the Turquoise colour. I love the purple that’s pictured on the site but it’s not listed as available so I would choose black. I would choose the Turquoise NuMe Signature Hair Dryer!! I would choose the pink SIGNATURE DRYER. I would definitely pick the turquoise! Thank you for the opportunity! If I won, I’d choose the turquoise one. It’s my favourite colour! I would choose turquoise if i won! I would choose the black hair dryer. Would love the turquoise one, such pretty colours. Definitely the turquoise for me 🙂 love it. I wish they had blue, but i’d go with black if we win, since the daughter who would likely use it the most would want that color. The blue one is so gorgeous! It doesn’t look like it’s in stock so my next choice would be turquoise. NuMe has such vibrant colors, any of them would be special to own! I would choose the turquoise – it’s a beautiful colour! I would choose the pink one. These are cute! I would pick the turquoise one. I love all of the colours! I’d pick the Turquoise, it’ll match my dressing room perfectly! I love the turquoise colour, so pretty! I would choose the turquoise one. I think my girlfriend would like the pink one the best, that’s which color I would pick if I won! I love the turquoise one! … I would LOVE to have a ‘Blue’ — NuMe Signature Hair Dryer…Beautiful Design !!! I think that I would pick the turquoise. I would pick the pink nume dryer! I’ve never owned a hairdryer..I know, crazy. But I’d like to try it! I would chose the pink one if I won. Thanks for the giveaway. I would choose the Turquoise. I would choose the Turquoise. Its different. I love that pink color. I would love the pink dryer! It would match all my other styling tools. I’d love the Turquoise dryer! I’d choose the Turquoise/Teal colour. Love it!! I liked the black one. I would choose turquoise if I was so lucky!! If I won, I would choose the turquoise color! So pretty! Thank you for the giveaway Aimee! I read the comments and I too have thick hair and hope this product will work! It sounds amazing. I would choose the Turquoise NuMe Signature Hair Dryer.